You know, try as I might to get myself psyched about tailgate parties, the minute I started thinking about football I froze up. I am not a big football fan. I did one Super Bowl post early in my blogging career with one of my favorite evil snacks –– deep-fried meatballs and a spicy dipping sauce… delicious but not good for a tailgate party (is there anything worse than soggy deep-fried food?). Not to be deterred, I looked into the history of tailgating and that widened my scope to include other sporting events because bringing food in the back of a car or a wagon to nourish sporting participants and spectators is as old as the hills. The Indians did it at polo matches thousands of years ago. Thinking about polo also made me think of famous English hunt lunches brought out to the fields to fortify the participants in the grueling event. These were elegant and delicious affairs (and horses are the only athletes I enjoy watching!). 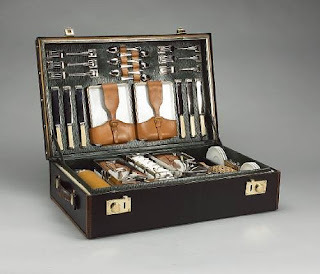 Fine china, crystal and linen were often packed into truly drool-worthy leather cases with elegantly tailored fittings to hold the dinnerware securely for travel. Great huge baskets were stuffed with provisions and hot and cold food were placed the appropriate containers with wonderful drinks (champagne? –– oh yeah). Spirit burners could heat up what needed heating and it all went off seamlessly with the precision of military maneuvers performed by a small army of servants with generations of experience via many tailgates or wagons or carriages. Another elegant and usually servant-less tailgating party possibility is one done for today's polo matches. The photo with the adorable tent on the vintage station wagon captured my heart as well. Although heart-stoppingly exciting to watch, Polo is a terrifying sport, if you ask me. I have no end of admiration for anyone who can play it at all, let alone well. The first time a mallet flew by my head going full speed down a field –– I retired from the fray, shaken and grateful I was not in the hospital or on my way to the undertaker. It is a wonder to watch from the comfort of the sidelines. Called the sport of kings and king of sports, both horse and rider operate as one and they fly and twirl like spirits possessed. 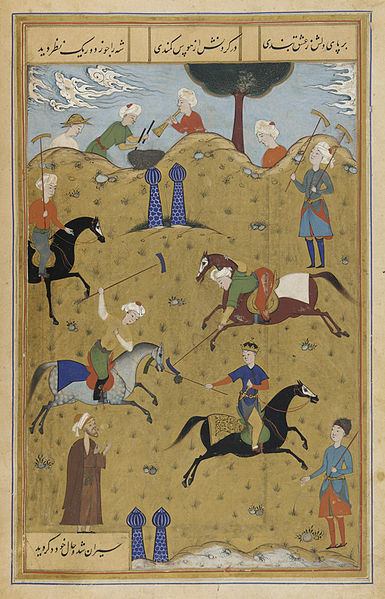 Tiny movements cause the horses to change course. I discovered this the hard way riding my neighbor’s new and supposedly untrained polo pony in my field… almost ended up flying over his gorgeous black head when I unknowingly made a knee command and he nearly did a 360º turn—he must have thought I was such a clod, I swear he rolled his eyes at me when I got off! As you doubtless know, Prince Charles and Prince Harry are both quite good at it –– they can afford to be. 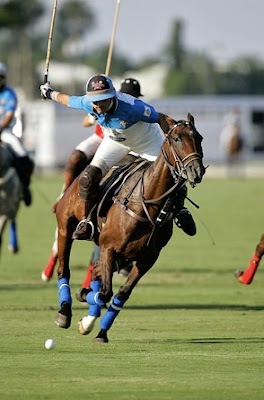 It is not a sport for a light pocketbook –– the rigors of the game demand many changes of mount during the course of the match, necessitating the proverbial “string” of polo ponies for each rider that need to be cared for and moved to matches, often by jet. 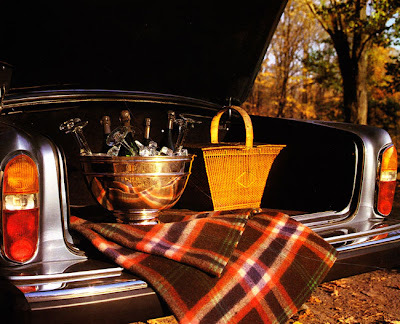 I don’t have one of those fabulous picnic hampers and my car’s trunk is not suitable for display (between the dog hair and tools… it would put you off your feed to be sure) so you’ll have to use your imagination for the setting. Just think of the tented tailgate above! 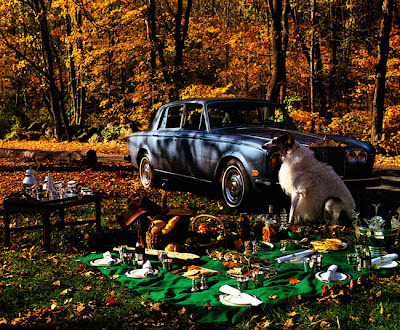 Finding NYT article from 1987 about preparing a polo picnic inspired me. In it, the author recommended elegant fare and well thought out menus that transport well. Caterer Jennifer Krascella made hazelnut biscuits with a rhubarb soup for the spread (along with cold veal stuffed with tuna, summer vegetables in vodka, cheese, fruit, berry-filled cones with marscarpone and of course –– an 80's menu for sure). The recipe had no milk or baking powder so I added that (I just couldn't figure out how a biscuit without them would work... go to the original if you are braver than I am... I also cut down the sugar since I was using them with a savory filling). It being fall, I decided to stick with the biscuits and add ham to make a bite-size slider, but then decided I’d share another old favorite of mine –– deviled ham. When I was a kid I loved the stuff. When I got older and looked at the ingredients as well as learning about factory-farmed pork –– I stopped eating it. Then I found this recipe, use organic ham, and, well, I was in love all over again. Sorry I can’t tell you where the recipe comes from since I copied it into my little black recipe book long ago but it’s delicious. Instead of the classic polo drink, Pimms Cup, I thought I’d share a wonderful drink I’ve made many times since I found the recipe, a pomegranate cider from long ago at the 21 Club (I shared this with you before but it seemed a perfect accompaniment for a tailgate picnic–– it’s so simple and delicious). Add a little alcohol and you are good to go on a cool fall afternoon! Place the hazelnuts in a food processor and process for 20 seconds. Place the butter and sugar in the bowl and combine well. Add the flour, salt, baking soda and hazelnuts and add, a half cup at a time, to the butter-and-sugar mixture. Mix until the flour is just incorporated. Add milk. Add the vanilla and chopped rose geranium. Place the dough in a bowl, cover with plastic wrap and refrigerate for one hour. Lightly butter two cookie sheets or cover with parchment paper. Remove the dough from the refrigerator and roll it into 1 1/2-inch balls. Place the balls a half-inch apart on the cookie sheets, smush them down a little. I used the extra ground hazelnuts to sprinkle on the top. Bake for 15 minutes, or until golden (mine took 20). Remove from the oven and allow to cool on cookie sheets for five minutes. Transfer the biscuits to a cake rack and cool for 10 minutes. Store in a tightly covered container. Saute onion in butter till soft. Add the mustard and flour and make a roux. Add the cream and simmer for 15 minutes. Remove from heat, add the ham and chill. Add the horseradish and Salt and pepper to taste (ham is usually salty… so see what you think). You may want to add more cream after it chills if it is too stiff. Also, it is better the next day. The biscuits are slightly crisp on the outside. I would recommend putting them together without the pickle so they don't sog up unless you are serving them immediately. Combine ingredients in pot. Warm over medium heat to bring to a boil, reduce heat and keep warm for 30 minutes. Strain and serve; garnish cups with a cinnamon stick. PS~ As some of you know, I have been on a sabbatical from my day job in the film business as a production designer. I am doing a little project for a great director that he has written. Not much money, great cast and a big dinner scene. I was wondering if any NYC area bloggers would like to contribute a beautiful dish to the effort for screen credit? Email me if this interests any of you. This would happen somewhere between the 8th and the 19th of November. Details to follow. PPS ~~ as a result, I will not be able to visit as much as I would like for the next few weeks and may miss a blog or 2... I'll be back before Thanksgiving!! We really were separated at birth!!! Now THIS is my kind of tailgate party! Love that deviled ham and the biscuits are adorable. And of course I will be adding alcohol to your lovely drink. We love eating food outside and always, and somewhat perversely, think that to do this in chilly weather if not the winter is somehow more spirited than in the lay days of summer when just a chilled drink will do. 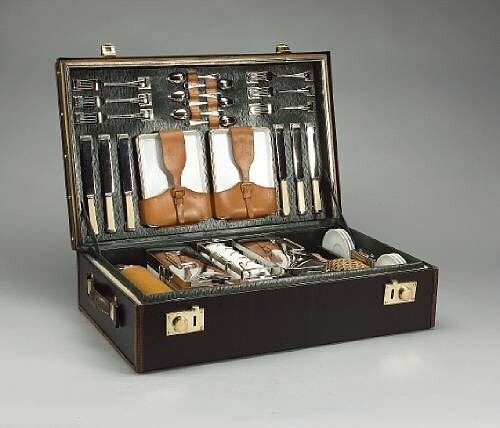 We have a 1930s picnic set for the purpose but sadly no Bentley or Polo ponies. Nevertheless, we do believe that with your inspirational biscuits and their filling we shall cut a dash at our next al fresco foray! 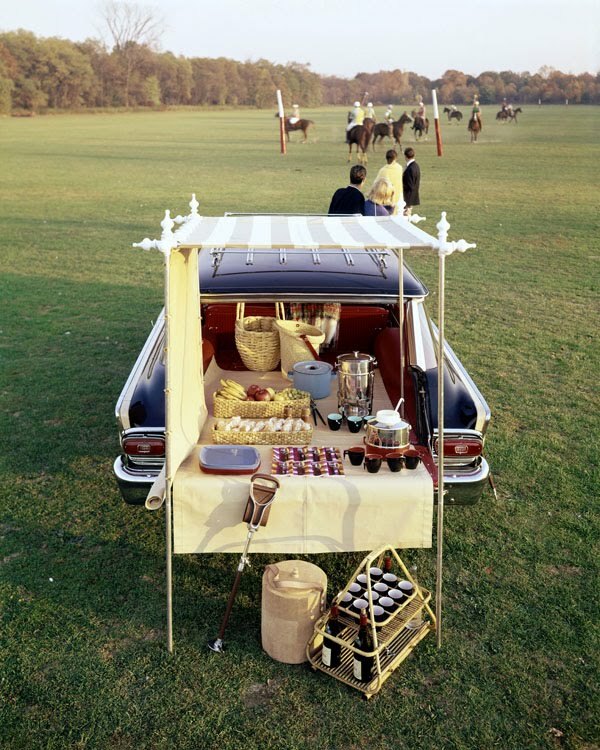 The idea of a polo picnic is so much fun! This is tailgating food that I could really get on board with. The sliders are lovely, I really like the idea of adding hazelnut! This is such a coincidence! I was having a discussion with my sister yesterday and she told me how popular tailgate parties are.....again. Although now they bring flat screen TV's and fancy grills to the parking lots. Was I hearing this correctly? I was astounded. Have you heard about this? Loved this post. Wouldn't we be good friends if we lived nearer? Our age difference wouldn't matter! As a faithful follower, I guess I am a wee bit disappointed in this post. Of course, I am not a fan of the sport of Polo (I could not afford to be, unfortunately, even if I had a modicum of interest), and I am not a "tailgater", as I prefer to eat food prepared in my own sanitary kitchen at home. And my wife, Doctor E. (R.N., Ph.D.), and I prefer to dine on a table, properly set with utensils and other accouterments which would be conducive to a more comfortable dining experience. Having said that, I would trust that you will soon return to your historical tomes accompanied by appropriate period culinary examples. My highest respect and good wishes. Oh Deana - So enchanting! I would be in heaven to be at your tailgate. Those ham biscuits are dreamy. Stupendous interpretation of this month's Tailgate Party. We used to have a polo field in Milwaukee, Uihlein Field. Now it's been converted to several soccer fields. Times change to fit the needs of the masses. It amazes me how wonderfully your photography fits seamlessly into your informational/historic posts. Another great post! Your delicious looking hazelnut biscuits and deviled ham totally make me think of Patrick O'Connell @ the Inn at Little Washington - so in his style (and he is my all time favorite). I absolutely must make these for 5 star foodie jr. The biscuits sound so good too..Thank you. Very elegant options, Deana - I like how you made the topic work for you! And, now I need to take a look at those deep-fried meatballs, too! Polo tailgating? I love it. And, I love your recipe. But, in reading the comments, I was surprised by DocChuck. Was he kidding? Does he not know blogs are personal expressions. He must be kidding. Pretty much in love with the hazelnut biscuit idea---would be fantastic all on their own! Lovely. Mr P was telling me how he was watching a TV show where Michael Palin was in Pakistan and they were having a polo match of sorts and they were roasting whole lambs :D. They know how to party my way :D.
THe hazelnut biscuits sounds absolutely to die for. p.s. I am fascinated by your upcoming project! I Hope you write more about it. Deana I just enjoy reading your posts so much! I love the information you always share before leading up to that special dish. You made a seriously gourmet tailgate game dish, especially with the pomegranate cider you are serving the biscuits with! And that polo tailgate picnic photo is simply classic. No, he was not kidding, he was expressing an opinion. And, NO, he was NOT kidding. He was expressing an opinion. And if that expression of an opinion offends you, I am truly apologetic, although I would NOT retract my comment because of your acrimonious response. Love your history research on the origins of tail gating. And I agree as well I would enjoy your style better then a football game lol. Very nice recipes, all of them! Deana this looks like it was an amazing tail-gate picnic...I am crazy for Calvados...I see that drink in my very near future! Thank you again for a wonderful post! Brilliant. Great idea. Beautifully executed. Boy, am I glad the you noted that the opening picture was from Tiffany -- otherwise, I was about to get stupidly jealous. Delicious, delicious all around. Must try everything! Growing up, I used to live right in FRONT of a polo field, so watched my fair share of chukkas! My father played (and still does, though he's 67) polo. Sadly we never tailgated out of the back of our four-wheel drive because we always had tents set up near the house. Your glamorous hazelnut biscuits and drinks are totally my kind of tailgating food! PS. Wished I still lived in NYC so I could help out with your project :-(. Love the Edwardian picnic basket. I'm not much of a tailgater or picnicker, because I don't want to eat with bugs. I tell folks it's all part of my charm. But your hazelnut brownies sound great for at home! I saw a St. Bernard at the book sale today. He had to stay outside, because they didn't want him in the church. He seemed more mannerly than some of the human children to me, but I guess that's why I'm a big dog person. How absolutely perfect Deana! :) And that polo tailgate party just looks so ...divine! NOW, leave it to you, to make something that is ALSO interesting (to me) and make it posh, elegant and definitely worthy of participating in!!! LIKE YOU, I do not enjoy football or any of those events. I actually LOATH them because my students put more value in that than education...oh yeah, I know....children love that more than school, but it seems to be getting more out of hand these days....BUT LIKE YOU, the only athletes I LOVE to watch, are the powerful and graceful equine beauties. THOSE HAZELNUT BISCUITS are a MUST to try dearest! AND THANK YOU for coming to visit me. I loved how you saw the METAPHOR of the powerful ruby slippers to take that extra step into a new venture. It sure is fun, and in only a week, I have made a little killing!!!! You are truly unique! 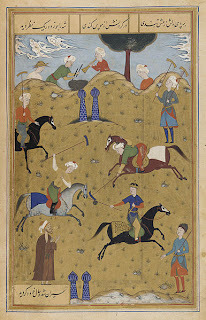 Is there any other blog around that includes a Persian miniature in a post on tailgating? And, you know, I had no idea that there was actually a recipe for deviled ham. You learn something new every day. Wow, this is some really impressive tailgate food! I love the sliders, but that pomegranite cider really sounds incredible. Sounds like the perfect compliment to the ham. 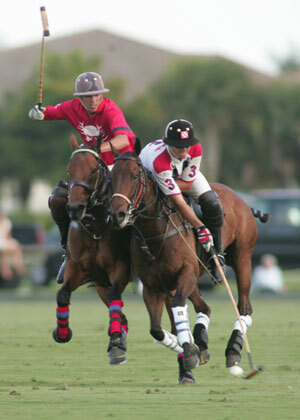 Polo was big in Calgary, too, where I previously lived. Well, it was big for a very select group! So glad I was able to attend a couple of matches. I don't think they tailgated, but if they did, it would be in this fashion! Thanks so much Deana for the history and pictures of tailgate party. I wondered the same thing but never got to discover the story behind it. Boo on me! Wow. deviled ham sounds really good. Let alone your homemade hazelnut biscuits! The cider..first I love the color but after looking at the ingredients, this is perfect for Fall! Yum i love hazelnut, these sound delicious. Thanks for sharing.